1. Preheat oven to 350 degrees F. Grease two round non-stick cake pans (8 inch diameter). In a medium bowl, whisk together flour, cocoa, baking powder, baking soda and salt and set aside. In a separate large bowl beat together butter, sugar, and vanilla with an electric mixer until well-blended, 3-4 minutes. Beat in eggs, one at a time, mixing well after each addition. With mixer at low speed, add in 1/3 of the flour mixture followed by half of the milk, beat, then add half of the remaining flour mixture and the rest of the milk, followed by remaining flour. Beat well, scraping the bowl with a wooden spoon, until the batter is homogeneous. 2. Divide the batter between two cake pans. Bake the cakes 25 to 30 minutes, until a toothpick inserted in the middle of the cake comes out clean. Cool the cakes in pans for about 5 minutes. Go around the sides of the cakes with a knife to loosen them from the pan, then remove the cakes from pans by inverting each one onto a plate and then place right side up onto a wire rack to cool. While the cakes cool prepare the frosting. 1. In a small saucepan, on low heat, melt together unsweetened and milk chocolate, stirring until the chocolate is completely melted. Turn off the heat and let cool for about five minutes. 2. With an electric mixer, in a medium bowl, beat butter and the melted chocolate until well-mixed. Add confectioner’s sugar and 2-3 tbsp half and half. Beat at medium speed until ripples form and frosting becomes thick and creamy, 3-4 minutes, adding more half-and-half if necessary for desired consistency. Cover and set aside. 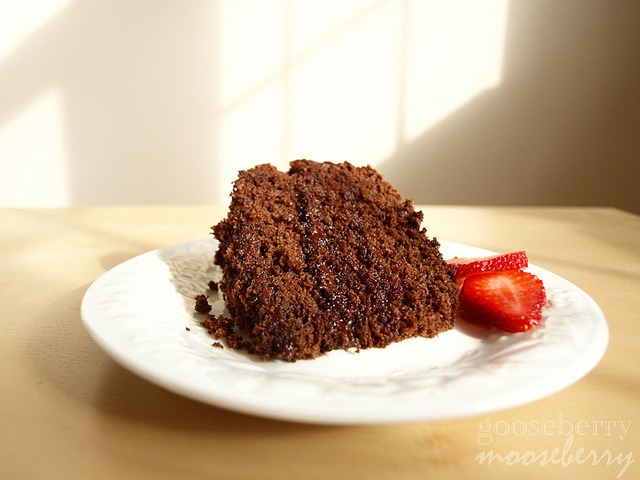 With a serrated knife, cut each cake in half, lengthwise. You will have four cake layers. Place one cake layer into a bowl and crumble completely with your fingers; the crumbs will be used to decorate the cake. Place one cake layer onto the serving platter, spread the frosting with a silicone spatula on top of the layer. Place the second layer on top and repeat. Place the third and final layer and spread frosting on top and around the cake. Sprinkle with crumbs on top of the cake, and press the crumbs with your hand around the cake’s sides. Serve or refrigerate.